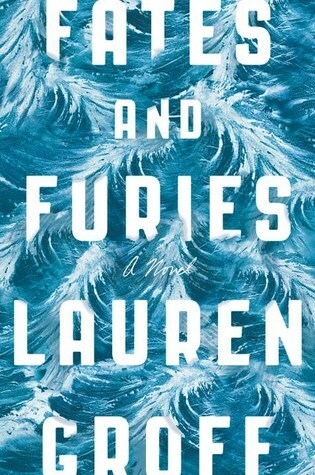 It is very rare for me to give up on a book, but I was more than halfway through Fates and Furies by Lauren Groff when I threw in the towel. I had been struggling through the novel for over a week, and when I decided I couldn't make the book group meeting and needed to start a review book in order to finish my review in time, I felt nothing but relief! This novel garnered plenty of critical acclaim when it first came out in 2015, though I remembered hearing a lot of mixed reviews from readers, as well. The basic set-up of the novel is intriguing: the story of a marriage, told in two parts, first from the husband's point of view and then from the wife's, and showing two very different perspectives on the same relationship. The reader gets Lotto's story (short for Lancelot) in the first half of the novel. He grew up in Florida, on the beach, with his mother, father, and aunt. His father died young, and when Lotto gets into trouble, his mother abruptly sends him to boarding school in New England, where she grew up. When he graduates from college, he meets Mathilde, a beautiful woman with her own painful childhood in her past. They are seemingly in love and the novel covers their lives together, first his story and then hers, as he becomes a famous playwright, and she supports his career. "A unity, marriage, made of discrete parts. Lotto was loud and full of light; Mathilde, quiet, watchful. Easy to believe his was the better half, the one that set the tone. It's true that everything he'd lived so far had steadily built toward Mathilde." Additionally, I just never warmed to either of the main characters (or any secondary ones, either). They felt like stiff caricatures to me, and I couldn't relate to them. They never felt real or three-dimensional. I think part of that was due to the language and narrative style. Finally, it's obvious from the title that mythology plays a large role in this novel. I know next to nothing about mythology. So, I suspect there was a whole layer of secondary meaning here that I completely missed, both in the main story and in the many plays that Lotto writes (some of which are excerpted in the text). Perhaps if I knew more about mythology, I would have discovered the cleverness inherent in the story...and maybe the narrative style would have made more sense, too. If you look at the reviews on Amazon for Fates & Furies, you see there is almost an equal number of ratings in each category, 1 through 5, which is pretty unusual for a book. Some people loved it, some hated it, and some, like me, felt ambivalent. You'll also see an almost endless list of glowing blurbs from highly acclaimed authors and publications. So, maybe I just didn't "get it." I did enjoy Groff's earlier novel, Arcadia. My book group ended up just cancelling the meeting when it got down to only three people left who were planning to go. From the e-mails that passed afterward and discussions with my friends, it seemed like most people in my group either felt the way I did and struggled with it or downright hated it. But, clearly, there are plenty of people who loved it. For a counterpoint, here is one of its many positive reviews, from Electric Lit, that highlights the links to mythology. And, hey, it was a finalist for the National Book Award, plus nominated for a host of other awards, so that has to count for something, right? Did you read Fates and Furies? What did you think? I'd love to hear your views in the Comments. Thanks for the support! It was disappointing since I liked her earlier novel, but that feeling of relief when I gave up told me it was the right decision!